On May 10th, 1960, John Fitzgerald Kennedy (JFK) won the Democratic nomination for President of the United States. 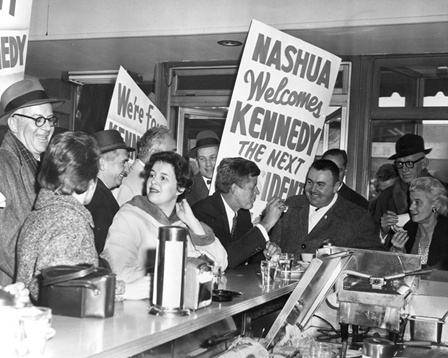 Kennedy used television as his main medium to campaign and for the first time, this was where voters gathered the majority of information about the candidates. JFK hoped to pull Catholics back into the Democratic Party, using his own religion to his advantage. Kennedy, although controversial and against the advice of his campaign managers, showed his support for Martin Luther King and worked for his release from an Atlanta jail in October of 1960. On November 8, 1960, JFK, running against then Vice President Richard Nixon, was elected to the Presidency of the United States. The election was one of the closest in history, with Kennedy winning the popular vote by a mere 118,550 votes, out of almost 69 million votes. JFK was the youngest person ever elected into the office, the first Catholic President, and the first President to be born in the twentieth century.